If you would like to give ShareAppeal a try, just click here. I’m excited to announce the beta launch of ShareAppeal, a new social app that enables us to build reading lists for our friends and help others discover new content online. Our friends know us better than anyone, and are best equipped to help us find interesting new things. ShareAppeal helps us build reading lists for each other, and save links for ourselves so we can read them when we have time. On ShareAppeal, you have your own reading list, populated with links from friends, and you have a list of links that you’ve saved for yourself. 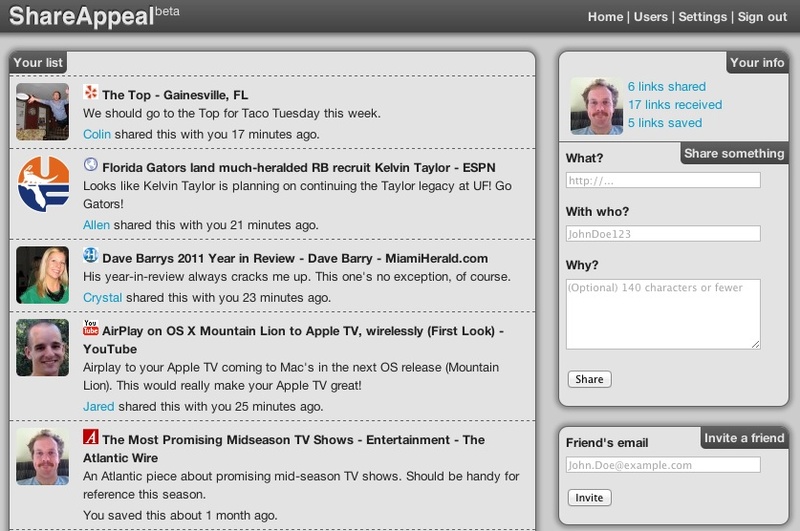 ShareAppeal will enable us to share things with each other and keep track of what we’ve shared and received. Sharing should be easy, and so should keeping track of what’s been shared with us. ShareAppeal will help us share all kinds of things with each other online (we’re starting with links, but hope to share much more). We also plan to integrate with other social networks to offer a more integrated online experience. Why did I create ShareAppeal? While I get a lot of good material from my friends online, I miss a lot of good material because I don’t happen to be on Twitter at the right time, or because I get bombarded with email one day and forget to flag a good one for follow-up. The result is that I’m missing out on a lot of good stuff that my friends have recommended for me. That’s frustrating because my friends take the time to discover and share cool stuff with me, and I know it’s stuff that I’ll like because they know me so well. ShareAppeal has helped me solve this problem: When my friends share things with me on ShareAppeal, I never lose the link or forget to check it out because it’s always there, waiting for me on my reading list. If they share it on Twitter and I want to make sure I don’t miss it, I just copy/paste the link into ShareAppeal to save for later. I know that I get a lot of use out of ShareAppeal, and several of my friends have enjoyed it as well. Now I need to grow the user base so I can see how others use it. That’s why I’m announcing ShareAppeal on my blog, Facebook and Twitter: I want to have more people participate. ShareAppeal has been a fun adventure so far, and I’m excited to give others the opportunity to come along for the ride. If you would like to participate in the beta, just click the link to get started. If you have any questions or want to know more, just leave a comment below. You can also Follow ShareAppeal on Twitter.